Carolina Friends School (CFS) was founded in 1962 by members of the Religious Society of Friends (Quakers) in Chapel Hill and Durham. CFS is a community of nearly 500 students ages 3 to 18 – and over 90 staff. The main campus is situated on 126 wooded acres, with a stream and nature trails, minutes from Durham, Chapel Hill, and Hillsborough, North Carolina. Our school forms a vibrant and inclusive learning community empowering students to think critically, creatively, and independently. We foster active exploration and quiet reflection, individual endeavor and collaborative engagement. Inspired by Quaker values — pursuit of truth, respect for all, peaceful resolution of conflict, simplicity, the call to service — we teach our children that it is possible to change the world. Learning at CFS is dynamic, experiential, and interactive. Students encounter open-ended questions, undertake original projects of real relevance, explore the natural world, and immerse themselves in service learning. In doing so, they build impressive powers of critical, creative, and independent thinking and expression. It is an exceptional education shaped by a clear set of beliefs: a commitment to Quaker values, a love of children, and a sense of hope for the communities, local and global, they will soon lead and serve. It is learning with a purpose; it is learning in nature; it is learning in the territory of ideas; it is learning in relationship; it is learning that is global and experiential; it is learning that is empowered; it is learning with a sense of high and hopeful expectation. In the classroom, sturdy, industrial tables and stools allow working while sitting or standing. In the summer of 2014, the completed expansion of the CFS middle school opened up several opportunities to create spaces that are conducive to implementing maker-related programs. In the upper school, we relocated our computer lab (into space previously occupied by middle school art) and used the old lab as a basis for our new makerspace. By expanding the old lab outward, we constructed an addition to the building resulting in a new space of roughly 1000 square feet. In December we moved into the new CFS MakerLab, where physics and geology classes share space with maker activities. 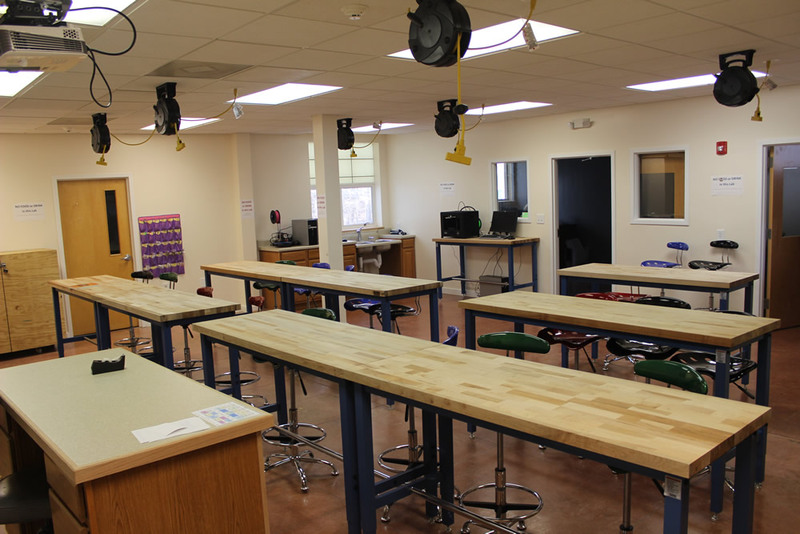 The MakerLab includes a main classroom with nine adjustable height butcher block tables and high stools so that students can work sitting or standing. The worktables are heavy-duty industrial units that will withstand vigorous use but are at the same time easy to reposition for added flexibility in the space. The original lab had a poured concrete floor, which we extended into the addition. To provide power to the worktables, we installed self-retracting extension cord reels to the ceiling at various intervals. A smaller room at the back of the classroom, intended to house equipment that is noisy, smelling, or otherwise distracting, can be used even when science classes are going on in the main lab. In the middle school, one of the new science labs is being used as an ad-hoc makerspace. The additional “elbow room” afforded by our renovations makes this an ideal location for maker activities. We currently run an afterschool maker program for middle schoolers in that space. Our lower school expansion, which begins this March, will include a new makerspace as part of the art studio building, particularly useful for our longstanding lower school design and engineering program. Two of our lower school teachers recently published Maker Elementary, a guide to designing and teaching in a maker classroom for children in upper elementary grades. This book is currently available for purchase on Amazon. 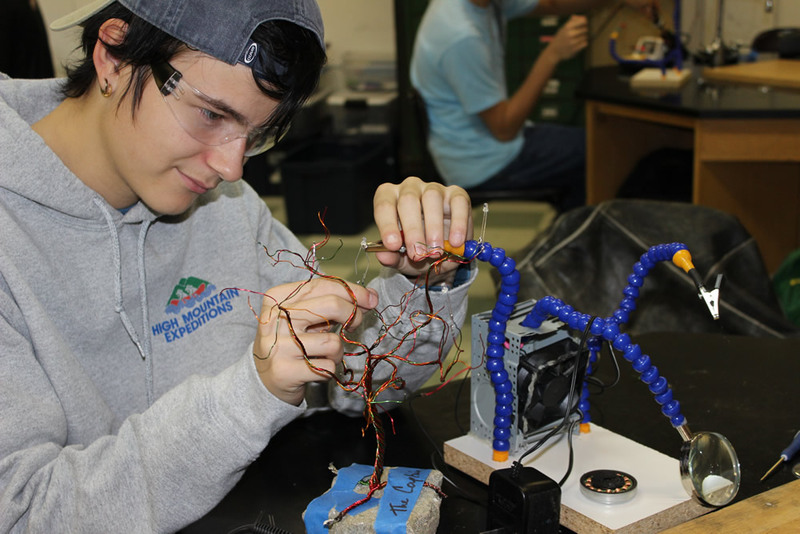 The maker program in the upper school MakerLab is still in its beginning stages. Currently, the Director of Technology is teaching one MakerLab class each term. In the fall trimester (before the lab was completed – we used a science lab), the Tools & Techniques class covered the basics of hand tool use and some basic electronics. Students designed and built various tools to be used in the new MakerLab. In the winter term, a Microcontrollers/Physical Computing class was offered, and in the spring term a course in 3D Design and Digital Fabrication will run in the lab. We currently have two 3D printers and will also acquire a 3D scanner to use in this class. In addition to maker-specific courses, we hold professional development classes to acquaint the staff with the program and give them a chance to participate in hands-on activities. One of our goals for this program is to engage teachers from all departments and create more cross-disciplinary opportunities for the students. We also plan to offer weekend workshops at which parents and students can work on projects together. We envision this as a collaboration between the upper and middle school makerspace teachers, with the possibility of enlisting upper school students as assistants/mentors. In our first MakerLab course, with the aim of creating tools for the then-unfinished MakerLab, students in the Tools & Techniques class worked on projects employing drills, tap & die sets, hand tools, and heat guns to construct “third hands” — tools that help hold small parts for soldering and other fine work. Using parts salvaged from old electronics equipment, they also designed and built solder fume extractors. In the final weeks of this course, students chose plans they found on various DIY websites and built projects following set instructions. Students in the Microcontrollers/Physical Computing were asked to use the programming and electronic skills they gained in the class to construct heads with Arduino brains as a final project. These heads needed to fulfill basic requirements such as accepting input from two separate sensors and showing a different reaction to each input. Sensors used included photoresistors, ultrasonic sensors, PIR sensors, flex sensors, and push buttons. The components used for “reactions” included LEDs, piezo buzzers, servo motors and regular motors. The students were conscientious about fulfilling the basic requirements, but also enjoyed the open-endedness of this activity and the artistic license it granted. In January, during a staff development half-day, the school’s administrative staff gathered in the new MakerLab to play and learn together. Each staff member constructed an LED tree that could be powered by their computer’s USB port or by an external charger — a project that had already proved a success with the fall term MakerLab class. During the afternoon, administrators added to their maker skillset with some basic hand and power tool use and soldering practice. At the end of the day, staff members returned to their offices to proudly display their light-up trees. We found this to be a positive and energizing way for staff members to set aside their work for a few hours and share a fun learning activity. Meanwhile, in the middle school, one of our science teachers is running an afterschool maker program designed as an alternative to the usual unstructured afterschool care. The first session of 15 students focused primarily on “soft” electronics, starting with Squishy Circuits and moving on to sewable/wearable electronics. Because our MakerLab is only about three months old at this point, we are not fully equipped with the tools and machines we’d like. We’ve ordered a small CNC mill that will allow us to add subtractive machining to our capabilities and will also allow us to machine custom circuit boards for electronics projects. This will be a good complement to our additive machining tools (3D printers). In designing our machine room, we allocated space and power for a laser cutter/engraver, so once we’ve gotten funding, we’ll be ready to add that piece in as well. Programmatically, we’d like to get more teachers involved in the makerspace. We envision creating more opportunities for teachers to come in and learn how to use the equipment, at least on a basic level. Once they see what can be done, they’ll be in a better position to assess how they might use the lab for some of their own lessons. We’re also exploring open lab time for students (and teachers) to come in and work on projects. Once we’ve gotten enough teachers up to speed on the equipment, we should be able to adequately staff the open lab program.